Although first reported in the 1960s - until the early 21st century - Enterovirus D68 was a rarely seen (and sometimes misidentified), seemingly mild viral infection (causing cold-like illness), mostly in children. In 2011 it gained some early notoriety when – in MMWR: Clusters Of HEV68 Respiratory Infections 2008-2010 – we looked at a half dozen HEV 68 associated clusters which occurred in Asia, Europe, and the United States during 2008--2010. 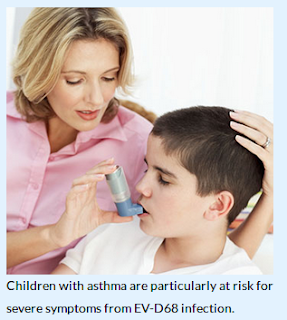 This report highlights HEV68 as an increasingly recognized cause of respiratory illness. Clinicians should be aware of HEV68 as one of many causes of viral respiratory disease and should report clusters of unexplained respiratory illness to the appropriate public health agency. The spectrum of illness caused by HEV68 remains unclear. HEV68, like other enteroviruses, has been associated with central nervous system disease (9). Further investigation could help clarify the epidemiology and spectrum of disease caused by HEV68. Some diagnostic tests might not detect HEV68 or might misidentify it as an HRV. Unlike influenza, classic enteroviruses tend to break out in late summer-to-fall, although EV-68 has been observed to occur well into the winter season. The largest outbreak characterized by this MMWR report involved 28 children and adolescents from Pennsylvania in the fall of 2009. Early in 2014, in Acute Flaccid Paralysis Cases In California, we looked at a cluster of 5 AFP cases in which 2 tested positive for EV-D68. Since neurological symptoms often develop days or weeks following a viral infection, testing only rarely returns a positive result. In the fall of 2014, we saw a nationwide outbreak of EV-D68 (49 states), producing a wide range of illness, including severe respiratory distress, resulting in the hospitalization of hundreds of children (see CDC HAN Advisory On EV-D68). At the same time, doctors around the country reported a concurrent spike in polio-like paralysis in children (e.g. AFP or AFM (Acute Flaccid Myelitis)) often following a viral illness. While most infections were either mild (or even asymptomatic), a small subset of cases experienced pneumonia or severe respiratory illness. Some, but far from all, of the AFM cases tested positive for EV-D68. EV-68, while high on the suspect list, wasn't the only virus in the line up. Other NPEVs (non-polio enteroviruses - particularly EV-71), West Nile Virus (and other mosquito-borne encephalopathies), echoviruses, adenoviruses, Campylobacter jejuni (leading cause of Guillain-Barre syndrome), along with a variety of toxins and poisons are also known to produce neurological symptoms, including AFM. While the evidence is often compelling, it falls short of definitive proof. And one of the stumbling blocks has been that until the past few years, EV-D68 was viewed as a relatively innocuous viral infection. Today, via the open-access journal mBio, we have a lengthy detailed research report that finds that (relatively) recently emerged strains of EV-D68 have become more neurotropic than were the classic strains circulating in the last half of the 20th century. Using both mice and neuronal cell lines (SH-SY5Y cells), along with non-neuronal cell lines (HeLa & A549 cells), researchers demonstrate differences in viral entry and replication between older (clade A) EV-D68 strains, and newer (clade B1, B2, and D1) strains, which appear to have emerged early in the 21st century. This is, admittedly, a long and complex report, and really requires reading it - probably more than once - in its entirety, to do it justice. When you return, I'll have a postscript. Enterovirus D68 (EV-D68) has historically been associated with respiratory illnesses. However, in the summers of 2014 and 2016, EV-D68 outbreaks coincided with a spike in polio-like acute flaccid myelitis/paralysis (AFM/AFP) cases. This raised concerns that EV-D68 could be the causative agent of AFM during these recent outbreaks. To assess the potential neurotropism of EV-D68, we utilized the neuroblastoma-derived neuronal cell line SH-SY5Y as a cell culture model to determine if differential infection is observed for different EV-D68 strains. In contrast to HeLa and A549 cells, which support viral infection of all EV-D68 strains tested, SH-SY5Y cells only supported infection by a subset of contemporary EV-D68 strains, including isolates from the 2014 outbreak. Viral replication and infectivity in SH-SY5Y were assessed using multiple assays: virus production, cytopathic effects, cellular ATP release, and VP1 capsid protein production. Similar differential neurotropism was also observed in differentiated SH-SY5Y cells, primary human neuron cultures, and a mouse paralysis model. Using the SH-SY5Y cell culture model, we determined that barriers to viral binding and entry were at least partly responsible for the differential infectivity phenotype. Transfection of genomic RNA into SH-SY5Y generated virions for all EV-D68 isolates, but only a single round of replication was observed from strains that could not directly infect SH-SY5Y. In addition to supporting virus replication and other functional studies, this cell culture model may help identify the signatures of virulence to confirm epidemiological associations between EV-D68 strains and AFM and allow for the rapid identification and characterization of emerging neurotropic strains. IMPORTANCE Since the EV-D68 outbreak during the summer of 2014, evidence of a causal link to a type of limb paralysis (AFM) has been mounting. In this article, we describe a neuronal cell culture model (SH-SY5Y cells) in which a subset of contemporary 2014 outbreak strains of EV-D68 show infectivity in neuronal cells, or neurotropism. We confirmed the difference in neurotropism in vitro using primary human neuron cell cultures and in vivo with a mouse paralysis model. Using the SH-SY5Y cell model, we determined that a barrier to viral entry is at least partly responsible for neurotropism. SH-SY5Y cells may be useful in determining if specific EV-D68 genetic determinants are associated with neuropathogenesis, and replication in this cell line could be used as rapid screening tool for identification of neurotropic EV-D68 strains. This may assist with better understanding of pathogenesis and epidemiology and with the development of potential therapies. While offering more support to the theory of a causal link between EV-D68 infection and (rare) AFM in humans, we are still not quite there. This study, however, by showing a neurotropic changes, does appear to get us closer. It remains to be seen whether EV-D68 turns out to be a viral flash in the pan, or if it becomes a more regular feature of our respiratory illness season, like some of the NPEVs that have already become pretty well established in Asia (see EID Journal: Emerging Enteroviruses In China 2010-2016). Perhaps just as importantly, this is another reminder that previously mild, or innocuous pathogens can change over time, and can present a bigger threat to human health. In 2016 we saw an obscure mosquito-borne disease (Zika) suddenly linked not only to sexual transmission, but to neurotropic and teratogenic sequelae, a trifecta never seen with an arbovirus before (see UCLA: Unraveling The Genetic Evolution Of Zika). In 2013, we saw an LPAI H7N9 virus turn into a deadly epidemic in China, and that changed our view of the risk and pathogenicity of H7 avian viruses overnight. In 2005, the Chikungunya virus acquired a mutation that allowed it to be carried by the Aedes Albopictus `Asian tiger’ mosquito (see A Single Mutation in Chikungunya Virus Affects Vector Specificity and Epidemic Potential). And over the past 50 years, myriad bacterial pathogens have developed resistance to our dwindling antibiotic armamentarium, with each year bringing us that much closer to a dreaded `post-antibiotic era'. As much as we'd like to believe that we have the scientific advantage over emerging infectious diseases, our ability to cope pales when compared to nature's ability to adapt. Reasons why the next global health crisis is always just around the corner.